This week, I am running pretty late for submitting entries for the WPC: Work of Art. 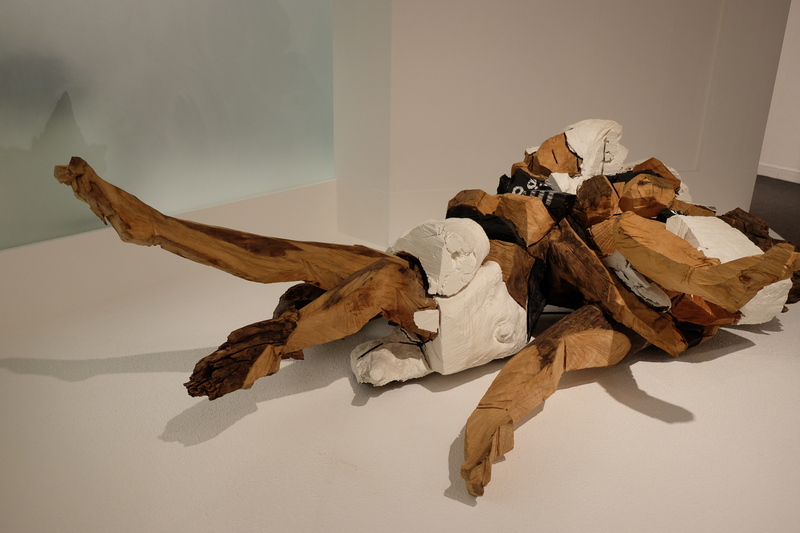 Here are two pieces of art – both wood sculptures by my favorite artist Ju Ming. It appears that the artist has retained a lot of the original trees; minimum sculpturing to give us these wonderful sculptures. The first sculpture is for a couple lying on the ground. The second one is a vertical one, representing a seated girl. 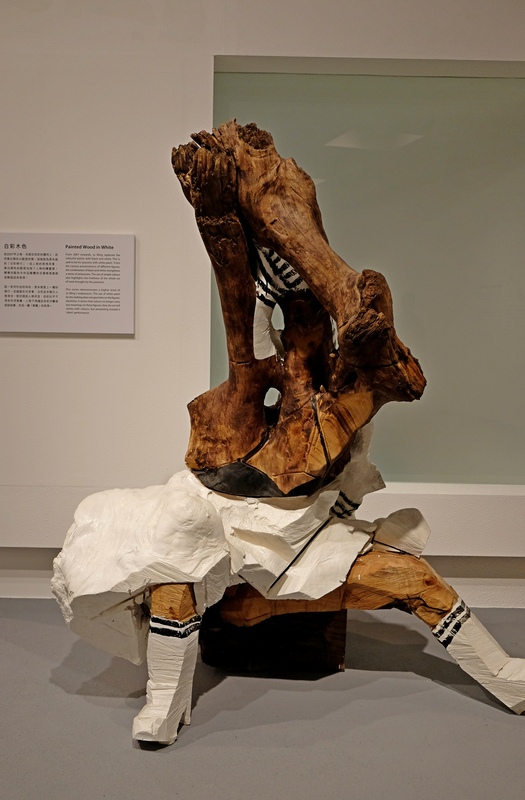 Since 2007, Ju Ming only painted his sculptures with white color only. 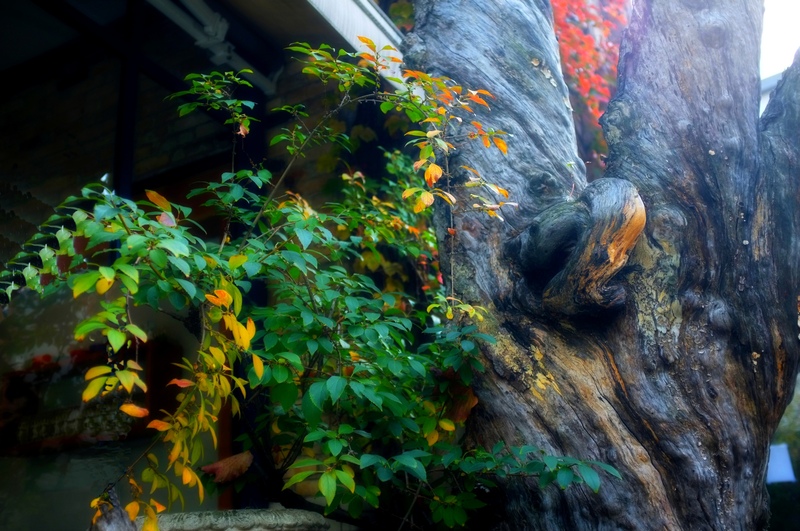 Last Autumn, I found this Wood outside a café by the side of a busy road in Seoul, capital of South Korea. It was a bit of strange to find this strangely shaped wood at such a location. The picture was taken with the focus aimed at the wood, but the wood is nothing without the green foliage on the left and the red foliage ( out of focus) on the top. 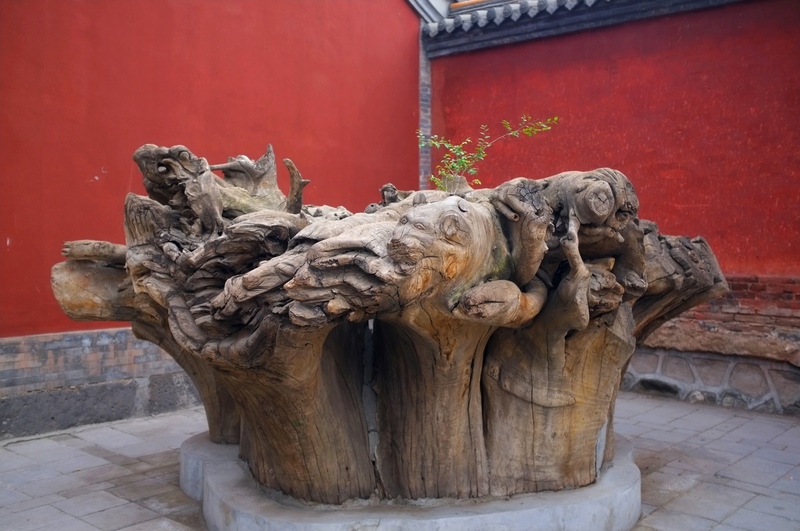 As a comparison, the second image is a tree stump that we came across in Inner Mongolia, China. It is said to be over 1,000 years old. Without any foliage as in the first picture to give it an artistic feel, with only a red wall as background, there is a lot less artistic quality in the picture. This week’s theme from http://suellewellyn2011.wordpress.com/a-word-a-week-photography-challenge/ is Wood. The Chinese have the five Elements making up the material world: Metal, Wood, Water, Fire and Earth. All of these elements are very important to us, some of the elements will enhance the others, for instance, water begets wood but suppress fire as it would put out a fire etc. The complex connections between substantial objects are explained through the relationship of interdependency and mutual restraint that governs the five elements. The Wu Xing, (五行 wŭ xíng) also known as the Five Elements, Five Phases, the Five Agents, the Five Movements, Five Processes, and the Five Steps/Stages, is a fivefold conceptual scheme that many traditional Chinese fields used to explain a wide array of phenomena, from cosmic cycles to the interaction between internal organs, and from the succession of political regimes to the properties of medicinal drugs. The “Five Phases” are Wood (木 mù), Fire (火 huǒ), Earth (土 tǔ), Metal (金 jīn), and Water (水 shuǐ). This order of presentation is known as the “mutual generation” (xiangsheng 相生) sequence. In the order of “mutual conquest” (xiangsheng 相勝) or “mutual overcoming” (xiangke 相剋), they are Wood, Earth, Water, Fire, and Metal. When travelling to Inner Mongolia last summer, I was very impressed by some wood stumps in a temple which are said to have lasted a thousand years. . . . . . . . . . . . . . . . . . . . . I like Wood in that it represents growth and expansion. I know I am dangerously treading on a Taoist subject which I don’t know much about. However, in my simple mind, I have always wondered what the world would be like if we do not have wood!